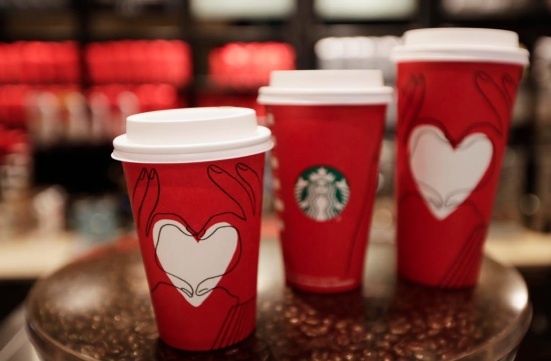 Some people think Starbucks' new red holiday cups are promoting a "gay agenda," and, what? You may have noticed that Starbucks unveiled their new holiday cups today, November 28th. The traditional red cardboard now also features an illustration of two hands coming together to form a heart. And apparently, some people are convinced that these new red Starbucks cups promote a “gay agenda.” Sigh. According to Business Insider, the limited-time design is intended to raise money for The Global Fund to Fight AIDS, Tuberculosis and Malaria. The cup is also the second design released as part of the company’s “Give Good” campaign, which promotes good deeds and kindness. Starbucks released a short video to launch the campaign on October 31st, 2017, which featured an illustration of a lesbian couple — among many other people — enjoying a cup of coffee. Apparently, because the new red holiday cups are also part of the Give Good campaign, they are now viewed as “suspect” by those unhappy with the above video. If by “gay agenda” these critics mean that Starbucks vocally supports LGBTQ+ rights (as in, equal rights for all humans) than we suppose they’re correct. Starbucks has long supported the LGBTQ+ community — as well as progressive, inclusive values in general — and has never shied away from their stance. We’re personally mystified as to how these particular red cups evoke any kind of political agenda…but as they say, haters gonna hate. And while they do, we’ll be over here enjoying our coffee in these delightful red cups (which again, contribute to the fight against AIDS, TB, and malaria).